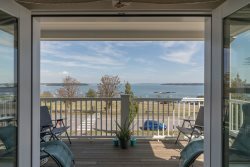 Furnished 2 bedroom 2 bath first floor condo on the desirable Falmouth Foreside. One level condo is newly furnished with contemporary fit and finishes. Kitchen offers all appliances including washer/dryer and plenty of counter space and bar area seating for 3. Hardwood floors throughout. Condo features air conditioning. Master Bedroom suite offers queen bed, his and her closets, master bath with custom shower and glass enclosure. Front guest bedroom offers queen bed, large closet featuring professionally designed closet system and 40" flat panel tv. Sunny living room offers comfortable seating for 5 and a 55" flat panel tv and desk area. Couch pulls out offering a queen bed for guests that will allow them to sleep in comfort. Private parking for 2 cars. Enjoy the outdoor grill, hammock, gardens, and firepit offering plenty of seating.